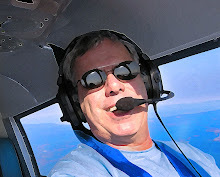 I am sitting almost dead-center in the penthouse of the FAA tower at Eugene, Oregon's Mahlon Sweet Field (KEUG). From my perch between the Tower Controller and Ground Control positions, I have a million dollar view of both runways, the GA ramp, and terminal area. Even though this is a sleepy Sunday morning, I am eager to watch my tour host, controller Ethan Abelov, work the traffic, to better understand what it takes to keep air traffic separated. Abelov was working both Tower and Ground when I sat down to observe, and initially, since I know the field well, I expected this to be a cakewalk. Sunday morning is dead at KEUG, but this being spring in Western Oregon, a nice weather day brings out the GA traffic. Even though this seasoned controller thought this was a "slow" shift, I have to say I seriously tried to keep tabs on every arrival, departure and ground movement, and failed miserably. Abelov handled it all with a calm that was one part cool and three parts professionalism, but had I been on position, someone would have ultimately had an unfortunate end to a splendid flight. First, I asked the required reporter question one always asks an Air Traffic Controller...is the job as pressure-packed as the ATC lore describes? And is sleepy old Eugene a boring post compared to, say, working the Tower at KORD? 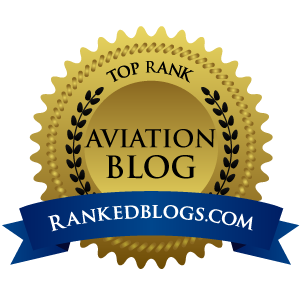 "At O'Hare, every flight you work is flown by a professional pilot, and they know what they are doing, so things go very smoothly. Here, you can have a 12-hour student pilot land without a radio call thinking they are in Salem," Abelov explained without missing a beat while sorting out a potential head-to-head situation where a R22 helicopter practicing the ILS 16R approach might have to be moved to make room for an MD-80 who had asked for and received permission to land on 34L against the grain. Once the Robinson was told to break off his approach and head west of the field, Abelov cleared the Skywest to land. But by saying those words, his job of landing the arrival isn't concluded. He begins scanning the runway for anything that could obstruct the landing, cars, people, birds, even a wayward "seasoned citizen" who mistakenly drives through the airport gate to cruise down the runway. That actually happened in Florida, but the make/model of the car remains unconfirmed. However, consensus is that it was a Cadillac Coupe Deville traveling very slow with its blinker on. As Abelov handles a steady stream of GA and scheduled traffic, I take a moment to scan the dozen or so electronic panels just in the Tower Controller position. To keep his world in order requires pushing, pressing, turning or throwing about 270 buttons, switches and knobs. The enormity of it all is overwhelming to the untrained eye, but to Abelov, he seems to know exactly where to place his fingers at precise moments in the dance. 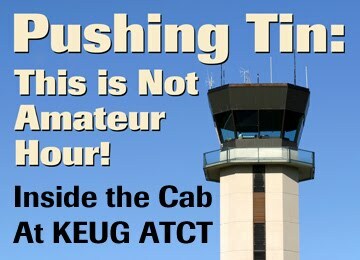 But while technology rules the Cab, and computers are at the heart of the ATC system, a small block of wood with TIPH painted on it is still an extremely important safety device. This small, low-tech memory aid must be held in the hand of any controller who instructs a pilot to Taxi Into Position and Hold. With SFO under flow control, Abelov has to monitor Skywest 6404's EDCT departure time, which changes a couple of times. He has GA traffic inbound from the south, north and west, two airliners simultaneously asking for push back and City Fire trucks doing simulated fire suppression exercises on the field. And that bizarro Russian twin-rotor helicopter with Canadian registration on the Flightcraft ramp? He filed IFR for departure but called the previous controller to change that to VFR before ultimately deciding his crazy Transformer-ish ship is broken and may or may not be departing. The Skylane that just departed north to Salem needs to be turned to the east to keep separation with a Dash 8 inbound from Portland. On his radar screen are 15 targets clogging up the sky over the Willamette Valley, but ATC is only talking to three. THREE! The rest, who the hell knows what they are doing next. Oh, and during all this, he has to find the time to record the new ATIS at the top of the hour. To manage all this requires – as Abelov says – an "obsessive–compulsive" attention to details. It has to, or things could get ugly fast. "Say I miss a guy's readback when he says he's cleared to ten thousand when we gave him nine," Abelov explains, "and he blasts off and starts climbing. My world (airspace) ends at niner thousand, so the guy justs plows right up into Seattle Center's airspace. That could cause an immediate deal, and it would have been caused simply by the controller missing an incorrect readback." At the end of Abelov's shift, he is replaced by two colleagues. With each handoff, a checklist is brought up on both position's main displays, and Abelov works down the list to make sure the new controller coming on position knows the who, what, when, where, why and weather of the current airspace situation. The handoff is smooth, and in a moment, we are out of the cab, down the elevator and the tour is complete. The major takeaway is that I grossly underestimated the many facets of controlling air traffic. Abelov is a natural at this multitasking exercise, as are his fellow NATCA controllers at KEUG ATCT. I knew the job was tough, but I had no idea it takes so much to simply spit me out a squawk code for VFR flight following. I watched the dance on a slow Sunday morning, and cannot even imagine what this job is like when things are crazy busy and tin is coming at these men and women from all directions and altitudes. Know this: Never, ever think that these controllers do not care about us pilots. More than anything, they want to give us what we want, when we want it, and try to do so in a polite, professional way. That is, until they need us to do what THEY need us to do, right freakin' now. Because when ATC gives an aviator an order, you can be sure there is no time in that controller's world to debate the point.